'Mad Magenta' ( Bee Warburton, R. 1986). Seedling 84-6-1. SIB, 26" (66 cm), Midseason to late bloom. 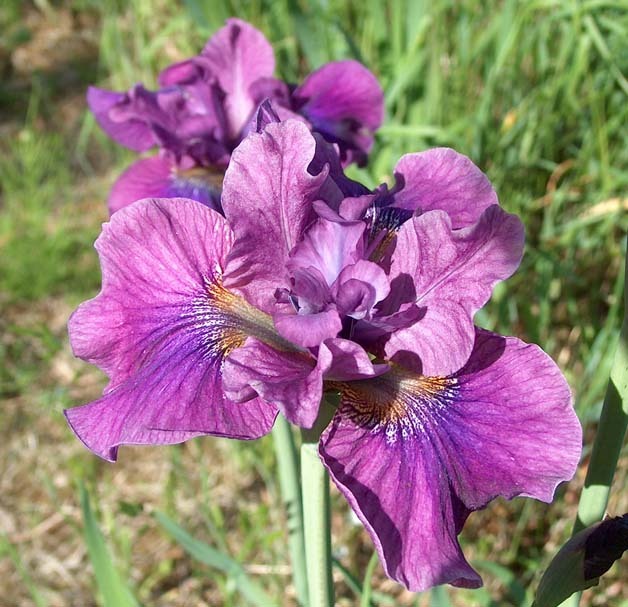 Ruffled magenta (RHS 77A) with bluer shoulders on Falls; fringed and curled styles. 'Percheron' X 'Silver Rose'. Joe Pye Weed's Garden 1987. From AIS Bulletin #264 January 1987 Introducing MAD MAGENTA-SIB, 26", M-L. A brand new color, wide and ruffled magenta self, bluer on the shoulders with no signal. Styles fringed and curled. One branch, 3-5 buds. Percheron X Silver Rose. $30.00. Joe Pye Weed's Garden.